Those tightly chinked logs do a pretty good job of keeping this historic cabin comfortable, but its old, single-pane windows had to go. The question was, what type of window would provide a look that was appropriate to the cabin, yet keep the natural wood interior that the old windows had? The answer is a wood clad window. That means the window frame is constructed in a choice of natural woods, but the exterior part is clad with vinyl or aluminum. 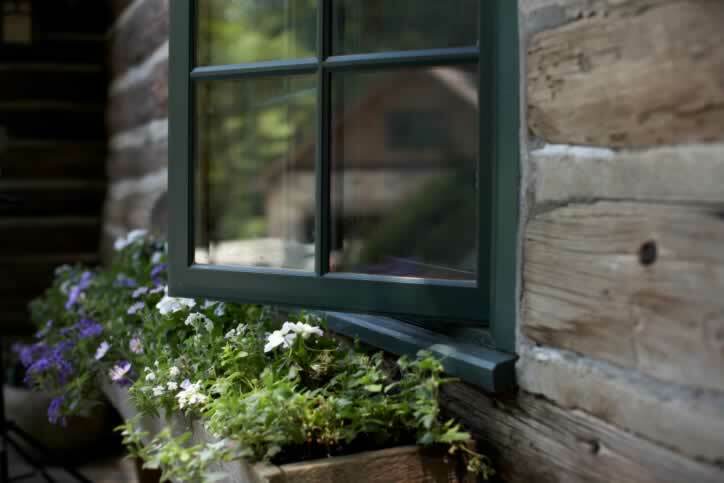 The color for vinyl clad wood windows is completely throughout the PVC vinyl. The aluminum clad wood windows have baked on color in a number of choices. Double- or triple-paned glass with insulation enhanced by air or inert gasses should greatly outperform those old single-pane windows. The exterior color for the replacement windows in this old cabin? Forest green, of course!